Want to boost your home's curb appeal and increase your home’s value? Adding a fresh coat of paint will easily hide any exterior flaws while updating your style and getting more for your remodeling dollar! 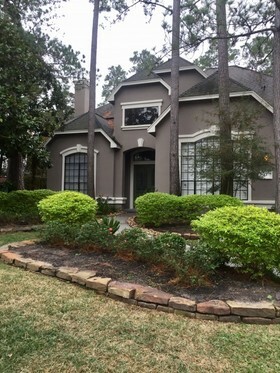 First Choice Painting & Remodeling has been a trusted local favorite for Meadows Place, Texas house painting projects since 1997. Why First Choice Painting & Remodeling To Paint Your Meadows Place House? From start to finish, First Choice Painting & Remodeling will be there to help you choose the best colors to use. We will make sure all surfaces are cleaned properly prior to the application process. We will make sure any exterior plants or surfaces that should not be exposed to any paint will be covered. As the expert painter in Meadows Place for house painting, First Choice Painting & Remodeling will get the job done right the first time. Whether you're looking for your entire house to be painted, touched-up, or want a color change, First Choice Painting & Remodeling can assist in making your visions a reality when we paint your Meadows Place house! Just call (832) 271-4712 today for a free quote. 5 ★★★★★ - "They did fabulous job! This is the second time we have used First Choice, and they are very professional. We couldn't be happier with the outcome of our house." 5★★★★★ - "I was more than pleased with the remodeling and paint job done by these guys. Clay and Pete are very professional, and take great pride in their work. Above all....THEY ARE HONEST! Thank you, so much for a fair price & great work." 5★★★★★ - "I am very pleased with my new bathroom! Clay and team demolished and remodeled it. The work was very professional and completed in a timely fashion. They are detailed and conscious about the quality of the work. Thanks, job well done !" 5★★★★★ - "Had this company stain the ceiling of my outdoor kitchen, paint my exterior doors, and paint my garage door. Job well done! Quality of work is top notch. I will be using this company again in the future." 5★★★★★ - "I had the exterior of my home and garage painted. The finished product was fabulous. The area around my house was always tidy. No paint splashes. Clay was so courteous and efficient. The easiest home improvement I have ever had." 5★★★★★ - "I had a complete bathroom demolished and remolded. My bathroom is amazing! Clay and team were very professional and timely. So very pleased with cost and workmanship!" 5★★★★★ - "Clay did some work on our house and it was a great job"
5★★★★★ - "Thank you, Clay...Again! Once again you exceeded our expectation on our patio roof project. I believe this is the fourth project you have done for us and each time we say "WOW"! Excellent service, great price, quality work, and also timely and efficient! You check all the boxes. Great job!" 5★★★★★ - "Clay and his team are extremely professional and punctual. His pricing was very reasonable and the services performed were excellent." 5★★★★★ - "We had water damage on an 18 ft textured ceiling. I called for a second opinion on an estimate. We discussed cost and rationale. He was very honest and straight forward. The quality of work exceeded my expectations and was well under the cost quoted by the previous company. I would also like to note that he came the same day I called and did the entire job the following day because he happened to be available. I got the impression that whatever he can do, he will do in the most efficient way possible, without compromising the integrity of the work. Nothing but good things to say here." 5★★★★★ - "Clay was quick and detailed. I contacted him on short notice and he did the job practically perfect! I love how the interior of my home looks. He was careful with clean up and placed everything back to it's original place. I will be calling him again for exterior work. Thank you Clay!" 5★★★★★ - "We would recommend Clay. He does a wonderful job and shows up when he says he will. We wouldn't use anyone else. We live in Magnolia"
5★★★★★ - "They painted our barn last year and we were impressed enough to call them back to paint our house. I would recommend them to anyone. Prep work to completion, they did great work. Easy to work with, hard workers and excellent job all around." 5★★★★★ - "First Choice Paint & Remodeling did a truly amazing job on our home! They were so professional and kind, and incredibly trust worthy always going above and beyond! I would recommend them to anyone! Our home looks brand new inside and out and SO UPDATED!" 5 ★★★★★ - "Clay did a great job painting the interior of my house. He definitely goes the extra mile. He is clean, efficient and easy to work with. I highly recommend First Choice Painting and Remodeling." 5 ★★★★★ - "First Choice Painting and Remodeling was recommended by a neighbor. I was very satisfied with the painting that Clay and Pedro did on the interior of my home. They went the extra mile. I highly recommend Clay Tyler." 5★★★★★ - "We've been using 1st Choice Painters for years. We trust Clay with our home and we have him back every year for maintenance. He is extremely professional, punctual, and meticulous. Give him plenty of notice to get on his list, because he stays busy! When he's finished with your home it will look like a fine wedding cake made by a fabulous pastry chef. If you need a perfect painter, look no further." 5★★★★★ - "We've had Clay and his crew paint multiple rooms over the years, hang cieling fans, and replace a fence/gate. They are always on time, do excellent work, and clean up after themselves every day until the job is finished. We will continue to call Clay and his team whenever we need things fixed, painted or installed at our house." 5★★★★★ - "Clay and his assistant painted the exterior of my house, pressure washed, replaced rotted wood with Hardi, repaired my gate and installed an outdoor light fixture. Clay arrived on time and worked diligently to get the job done. I am extremely satisfied with all the work and will recommend First Choice Painting & Remodeling to friends and will also call him the next time I need a job done!" 5★★★★★ - "Clay and his co-worker were the most helpful and courteous hard workers you could ask for. They were always on time and did a fantastic job. Clay went out of his way to accommodate my needs to get around in my house in my powerchair. He even did a few extra things for me and it was most appreciated. We loved their work so much we had him do my mother-in-laws house when he completed our house. They did an excellent job with that as well. Now we are working on him painting our son's house as soon as possible. I would highly recommend him and his co-worker Pete." 5★★★★★ - "Clay and team went above and beyond what I asked. Very professional and eager to help, even if its out of the scope of work he's hired for. I'd highly recommend First Choice to any of my family or friends. Thanks Clay, for all your hard work!" 5★★★★★ - "They did all I asked for and more. Cleaned up after themselves each and every day. Never felt any imposition or need to get out of their way. Each job they tackled was completed quickly and neatly. The men showed true professionalism in their work. I could not have been more pleased." 5★★★★★ - "Clay and Pedro are the best! First Choice Painting & Remodeling offers excellent workmanship and add value to a customer's home for an affordable price. You will bring them back again and again to maintain the appearance of your home." 5★★★★★ - "I would recommend this company for any project you have. I have used them several times over the years and they did an outstanding job were always on time and very professional." 5★★★★★ - "First Choice Painting & Remodeling was professional from start to finish. The representative that I spoke to was very knowledgeable, courteous, and lead me in the right direction with what I needed done. Setting up an appointment was a breeze and the crew did a impressively thorough job with painting our home. They had a great eye for attention to detail and cleaned up everything extremely well. I'd definitely recommend them." 5★★★★★ - "First Choice Painting & Remodeling has been doing work for me for 17 years. Every time I call him to make an appointment he is always there on time. They are really neat and they clean everything up after they are finished working. Great experience." 5★★★★★ - "We have relied on First Choice Painting and Remodeling contractors for many home improvement projects over the years and have always been really pleased with the work, the time in which they complete it, the minimal interruption to our family and their quality. They have done everything from a full bathroom upgrade (including shower and tile flooring), our kitchen renovation (including new sheetrock and drywall repair and window replacement), siding installation and power washing, the list goes on. Every time their prices are fair, they get back to you quickly and their quality of work is second to none! If you are looking for an insured and licensed painter and remodeler, we recommend First Choice for any home repair job around the home, no matter how big or small. " 5★★★★★ - "Upon hiring Mr. Tyler and his worker, I was very clear what my expectations were. He gave me direct eye contact and assured me how long the job would take and a estimate upfront. I was very pleased how the work turned out and he demonstrated integrity and compassion through his work. I certainly give him a high 5 !!!!" 5★★★★★ - "I will never take a chance on another painter. Great work. You can't even SEE where they did drywall work. They use quality materials and make the extra effort to leave you with a clean and professional end result. Highest praise."